Major success for Crossrail and London Underground at NCE International Tunnelling Awards - Crossrail . For information about the Elizabeth line please visit the Transport for London website. Crossrail, Europe’s largest infrastructure project, won the Judges’ Supreme Award at the 2015 New Civil Engineer International Tunnelling and Underground Space Awards. London Underground won the prestigious Global Tunnelling Project of the Year (under $500m) Award for the Bond Street station upgrade. Crossrail tunnelling began in 2012 and ended at Farringdon in May with the break through of tunnelling machine Victoria. 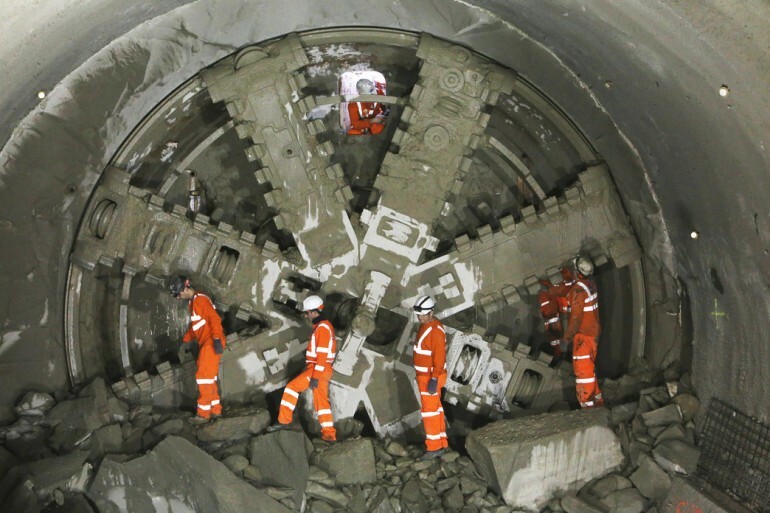 Eight 1,000 tonne tunnelling machines bored 26 miles or 42 km of new 6.2m diameter rail tunnels under London. As part of Transport for London’s (TfL's) multi-billion pound investment programme to improve and expand the transport network, the Bond Street Station upgrade project team are reconfiguring the station to provide 30 per cent more capacity. The upgrade work will result in fewer delays, less congestion, step-free access and quicker journeys for customers in and out of the station. The brand new ticket hall, currently under construction beneath Marylebone Lane, will open in 2017. London is currently the fastest growing capital city in Europe and today it is home to 8.6 million people with the population expected to reach 10 million by 2030. TfL’s work to upgrade stations such as Bond Street, Tottenham Court Road and Victoria, as well as increasing capacity on the busiest lines, is critical to supporting the continued growth and regeneration of the Capital. When TfL-run Crossrail fully opens it will provide much needed new transport links and capacity, helping to support London’s continued economic growth and meet the demands of the Capital’s rapidly growing population. The Government, the Mayor of London and TfL are investing in Crossrail and other transport infrastructure to support access to jobs, education, housing and to boost economic growth. Crossrail will add 10 per cent capacity to central London’s rail network. It will serve 40 stations, connecting Reading and Heathrow in the west with Shenfield and Abbey Wood in the east. Services through central London will commence in December 2018. An estimated 200 million passengers will travel on Crossrail each year. London Underground is working with its delivery partner Costain Laing O’Rourke JV (CoLOR) on the Bond Street station upgrade. Although the upgrade is large in scale, the site occupies a mere 440m2 at surface level between 354 - 358 Oxford Street, presenting significant logistical challenges. 550 metres of new tunnels have been constructed and over 46,000 tonnes of ground have been carefully excavated – a significant amount by hand – around historic assets, including the disused London Post Office Railway.